Since the 1940s, the one-size-fits-all solution to urban traffic problems has been road construction, and it’s a solution that comes only in two sizes: big and bigger. Build ’em wider, add some lanes, raise ’em to the sky and up the speed limit. Keep at it long enough, and eventually there’ll be enough room in the city for all those fast-moving cars. TRAFFIC UNJAMMED: On San Franciscos waterfront, the Embarcadero is a thriving public space once occupied by an elevated freeway. It’s a political no-brainer. Traffic woes top the list of city-dweller complaints in elections at every level, and what better response could a politician give than to promise more roads, better roads, expressways, highways, express highways and superhighways and freeways and parkways? If you’ve got two cars and a single garage, what do you do, Joe Homeowner? You build a wider garage. Same deal with a road, right? It’s just common sense. Metro areas that invested heavily in road capacity expansion fared no better in easing congestion than metro areas that did not. Trends in congestion show that areas that exhibited greater growth in lane capacity spent roughly $22 billion more on road construction than those that didn’t, yet ended up with slightly higher congestion costs per person, wasted fuel, and travel delay. This is a conclusion worth repeating: spending lots more on roads increased the toll exacted by congestion. Building more highways intensifies the urban traffic mess. Not only do highways fail on their own promise of smoother commutes, they ruin the cityscape around them. That’s why the most promising trend in urban traffic management is the destruction of highways — particularly the “grade-separated highways” so beloved by the previous generation of urban transportation departments. A particularly dramatic case in point comes to us from traffic-clogged Seoul, Korea, where a few years ago a handful of “crazy” visionaries in the transport department somehow managed to sell a new mayor on the demolition of an elevated downtown highway. Fast-forward to today: the highway’s gone, a formerly paved-over river has been rehabilitated, the resulting green space is a source of urban pride, and — wait for it — motor vehicle travel times have actually improved in the neighborhood of the old highway. Similar results have emerged from American highway demolitions. Alas, tearing down highways is a very hard sell politically, so the best U.S. cases in point were precipitated by natural disasters — the collapse of the West Side Highway in New York in 1973 and the demolition of San Francisco’s Embarcadero Freeway after it was heavily damaged in the 1989 earthquake. This should, by rights, become the new common sense in urban traffic management: The cars will find a way, and if they don’t then people will use other forms of transportation. And the net impact on the livability of the city will be positive in every case. The only good downtown highway is a demolished downtown highway. We Need to Hear From You! The Lindbergh LaVista Corridor Coalition, in conjunction with urban design firm Perkins + Will, is excited to announce an upcoming Spring Planning Workshop on Saturday, 7 May from 8:00am – 1:00pm at the Center for Spiritual Growth & Meditation to gain community feedback on the future development of our area. The Center is located at 1893 Piedmont Road NE, Atlanta, GA 30324. As you know, the LLCC’s aim is to improve the environment around us and the quality of life in our community. We need your input to be able to influence the type of development we’ll see in the LLCC area. The upcoming workshop will focus specifically on the area around Cheshire Bridge Road and LaVista Road and Lindbergh Drive. Please take a few moments to answer the following questions. All feedback is anonymous. The LLCC will use this information to guide our discussion at our Spring planning workshop on Saturday, 7 May, where we will have representatives from the commercial property owners in this area, as well as government officials. For more information on the workshop, please visit www.lindberghlavista.org. Hopes for regional transit funding are lining up. When it was originally proposed in 1965, MARTA was supposed to be the transit authority serving the entire Atlanta region, then splayed out over five counties. Yet the system required funding to be put in place, and when asked to devote some of their sales taxes to the cause, only people in Fulton and DeKalb Counties — the most central of the region — agreed to pony up. So the rail system that began operations in mid-1979 remains constrained to those counties’ borders. Lacking needed funds, the original system plan has yet to be completed. That’s in spite of the fact that the ten closest-in Atlanta region counties now house more than 4.1 million people and have grown significantly over the past half century. Partially because of the failure to expand MARTA, the region’s transit mode share of work trips has declined disastrously from 16.8% in 1960 to 3.7% today. New transportation projects have been few and far between: Currently, the only transit program that has its funding secured in the Atlanta region is the short (and, from the standpoint of the region’s larger needs, modest) Georgia Transit Connector streetcar, which was funded by a U.S. Department of Transportation TIGER grant last fall. Fortunately, the area’s residents will be allowed to vote next year on an increase in local funding for transportation through a 1¢ sales tax, which would extend across the ten counties if it were approved by the population. The referendum, which is expected to raise up to $7 billion in additional resources over the next ten years, was made possible because of the passage of a Georgia state law in June 2010 largely pushed through by new Atlanta Mayor Kasim Reed. The flow of dollars holds great promise and could be instrumental in aiding the region develop its meager fixed-route public transportation network into something more convenient. Already, cities and counties across the region have submitted $24 billion in potential projects to be funded with the money, far more than could be distributed. (15% of dollars raised will be spent by constituent local governments, with 85% remaining allocated by the regional planning authority for projects determined by a regional “roundtable” group.) The final list of projects that would be funded by the tax will be determined in October. Despite the clear need for improved transportation in the metropolitan region, though, there is no guarantee that county populations will approve the sales tax increase or that the projects chosen for funding will be appropriate in guiding the area’s growth. The first problem is serious: The anti-government sentiment currently festering in the United States is likely to negatively affect proposals that would do a lot to expand the commuting options for one of the nation’s largest regions. Though transportation sales tax increase measures have fared well in cities from Charlotte to Los Angeles, whether they can pass in broad sections of the suburbs is a different matter. It seems almost inevitable that the citizens of Atlanta will vote in favor of the proposal, even though it will double their sales taxes dedicated to transport, but getting people to do the same in exurban sections of Gwinnett County will be much more difficult. It didn’t happen 40 years ago. Second, even if the tax increase is passed, the projects funded will not necessarily contribute to positive change in this sprawling metropolis. Though MARTA has a number of transportation expansions under study, parts of the $7 billion will be distributed to roads projects as well. Outside of Atlanta proper, which contains just 10% of the larger region’s population, there is likely to be more support for highway infrastructure than bus or rail investments. Some advocacy groups have already begun pushing to ensure that transit gets its “fair share” of funds, which they argue is 60% of the total, or $4.2 billion over ten years. That’s a big sum even for a region as large as this one, but it may also be too optimistic, especially if those making the list want the measure to pass in car-dominated outer sections of the area. The respective influence of these rival factors will be better understood once the list of projects to be funded is finalized later this year. What seems likely are a serious of compromises, largely involving the extension of transit lines out into the suburbs, investments that return fewer transportation benefits than equivalent projects in the core but which could offer a motivation for voters and politicians from areas outside of Atlanta to support the tax increase. Bus rapid transit or heavy rail extensions from each of MARTA’s current termini have been proposed; these offerings would be heavy on cost but likely limited in spurring new construction around stations and encouraging car-free lifestyles. Their inclusion in the plan, however, may be necessary to acquire the necessary political support for the program over the next year or so. Nonetheless, the potential for great improvement in Atlanta area transit is exciting. The Beltline, which would ring the city’s core with a light rail route coordinated with transit-oriented development, is a role model for the rest of the country — and the city has appropriately argued that a large percentage of the funding go to that project. In addition, a connection between Lindbergh Center and Emory University, a project that (in a different form) was part of the original MARTA network plans, has been revived as a regional priority and could finally see the light of day. DETROIT — When Marja M. Winters was studying urban planning in graduate school, she learned the art and science of helping cities grow. Now Ms. Winters, a native of Detroit and the deputy director of the city’s planning and development department, finds herself in an utterly unexpected role, one that no school would have thought to prepare her for: she is sorting out how to help her hometown shrink, by working through difficult decisions that will determine which neighborhoods can be saved and which cannot. Puzzling through the best way to downsize a city it is not unheard of (it has been considered in Youngstown, Ohio, and Flint, Mich. and even, decades ago, in New York). 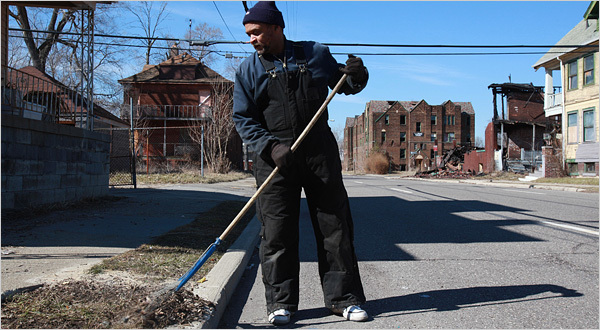 And Mayor Dave Bing has made it a priority to deal with Detroit’s fast-sinking population and crumbling infrastructure by steering those who remain into fewer neighborhoods, rather than leaving them scattered throughout the 139-square-mile city, whose boundaries made more sense when twice as many people lived here 40 years ago. Actually carrying out such an effort, particularly in a city as vast as Detroit, is like solving a complicated set of interwoven puzzles, as Ms. Winters has discovered over many long days and some nights poring over thousands of pages of maps and statistics in her 23rd-floor downtown office. How to reconfigure roads, bus lines, police districts? How to encourage people — there is no power of eminent domain to force them — to move out of the worst neighborhoods and into better ones? Later this month, a team that includes Ms. Winters is expected to present a proposed — and certain to be highly controversial — map to guide investment in each of the city’s neighborhoods. A final plan for a remade city is expected by year’s end. Detroit is already shrinking on its own, of course. Recent census figures show the city, once the nation’s fourth largest, lost a quarter of its population in the last decade alone, leaving it with fewer than 714,000 people. But the losses have been spread around the city, meaning that vacant, dilapidated homes and empty lots speckle Detroit’s neighborhoods, rather than cropping up in consolidated, convenient chunks on the city edges, leaving a more vibrant core. In fact, some of the city’s best-kept neighborhoods are on its outer edges, while the troubled spots are closer to downtown. And so, a contingent of private consultants and city officials like Ms. Winters have taken part in one of the deepest mile-by-mile analyses of Detroit in memory, tracking population densities, foreclosed homes, disease, parks, roads, water lines, sewer lines, bus routes, publicly owned lands, and on and on. Among the dismal findings: more than 100,000 parcels, private and public, are vacant; and only 38 percent of Detroiters work in the city. The goal is to identify the strongest, most viable neighborhoods, which would receive extra attention and help from the city. The residents of some of the weakest, emptiest neighborhoods would be encouraged to move into them. It will be a difficult sell for people like Luther Gordon, whose home on the east side of the city sits across from an empty house that burned down a few nights ago and a vacant lot on a block with many vacant lots. Rumors are winding through neighborhoods. Chief among them is that the worst neighborhoods will actually be closed, with the power turned off and buildings bulldozed. The true intent, Ms. Winters said, is far more nuanced, and slower-moving. Though the city will offer some kind of incentives for people in miserable neighborhoods to move, no neighborhood will be simply shut down, she said. A place deemed not worthy of new residential investment might see subtle shifts: services like garbage pickup, she said, could slow to every 12 days from once a week. “We want to reduce the city’s cost of delivering services, but we also want to support a baseline quality of life — the key is how do we balance that out?” Ms. Winters said. The ultimate plan for those neighborhoods — and the ultimate cost of consolidating them — is uncertain; some might become home to new industry, and some might be used to fill temporary needs, or for urban gardens and green space. In more well-to-do neighborhoods, like Indian Village, where mansions fill the blocks and lawn-service crews were out in force last week, the idea of shrinking the city’s neighborhoods sounds appealing to many residents. “When I go in some of the neighborhoods now, I have tears in my face, I just can’t believe what I see,” said Rukayya Ahsan-McTier, who was walking briskly for exercise in Indian Village, while clasping a golf club in one hand for protection from stray dogs or, as she said, any other trouble that might come her way. Still, even Ms. Ahsan-McTier had lingering doubts about how the city’s plan would work. How would the city persuade people to move from less expensive neighborhoods to more expensive ones? And would the new neighbors mesh? Elsewhere, others had their own worries: Would this simply amount to another chapter of “urban renewal” in which the poorest, least educated and unluckiest would be forced to move? For their part, city officials say the police and firefighters will always serve all Detroit neighborhoods — even ones where only a few people may be left. Mr. Bing’s hope is that a “core group” of neighborhoods connected to downtown, and to the city’s spine, Woodward Avenue, will remain, and that the master plan will ultimately help end the exodus of Detroiters. Lately, Ms. Winters has spent hours meeting with large groups to talk about their concerns, their questions and their doubts over the plans. Last week, clergy members quizzed her; before that, older residents. Later this month, she is to meet with youths, artists, environmental advocates and entrepreneurs. NAR’s 2011 Community Preference Survey explores Americans’ wants regarding neighborhood characteristics such as proximity to parks and shopping, walkability, and commuting time, and the trade-offs in home type and size that people may be willing to accept in order to obtain those neighborhood preferences. The survey reveals that most Americans would like to live in walkable communities where shops, restaurants, and local business are within an easy walk from their homes, as long as those communities can provide detached single-family homes. The survey also shows that most Americans would choose a smaller home and smaller lot if it would keep their commute time to 20 minutes or less.